I love weddings, and who wouldn’t? These days, weddings are clearly some of the most creative special events in the industry. It seems that every bride wants something beautiful, special, and of course, unique and reflective of herself and the groom. 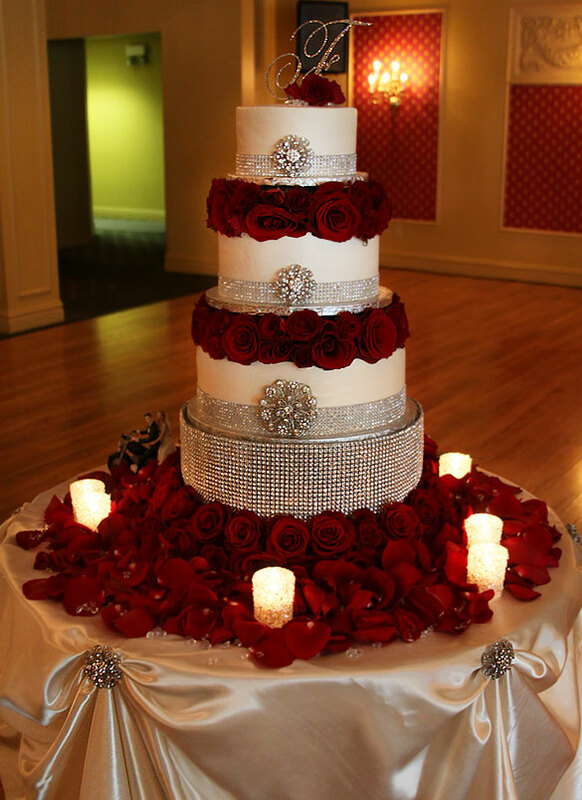 From cakes to centerpieces, creativity seems to be endless. And as you can imagine, this goes double for a bride who also happens to be in the wedding industry herself. That was the case with my friend Sandra, who owns Sandra Fulton Designs. As a custom floral designer, she will not hesitate for a minute to let you know that she is the ultimate floral Diva! And what better place to showcase her endless talents? At her own wedding, of course! Sandra chose to have both her ceremony and wedding reception at Ces and Judy’s in Frontenac, Missouri. Their event facility is intimate and cozy, yet comfortable and unique. Sandra’s design elements were easy to spot. Beautiful exotic florals, rich embellishments, the colors lavender and red, and BLING… lots of BLING! The first “wow” factor of the wedding was the invitation. 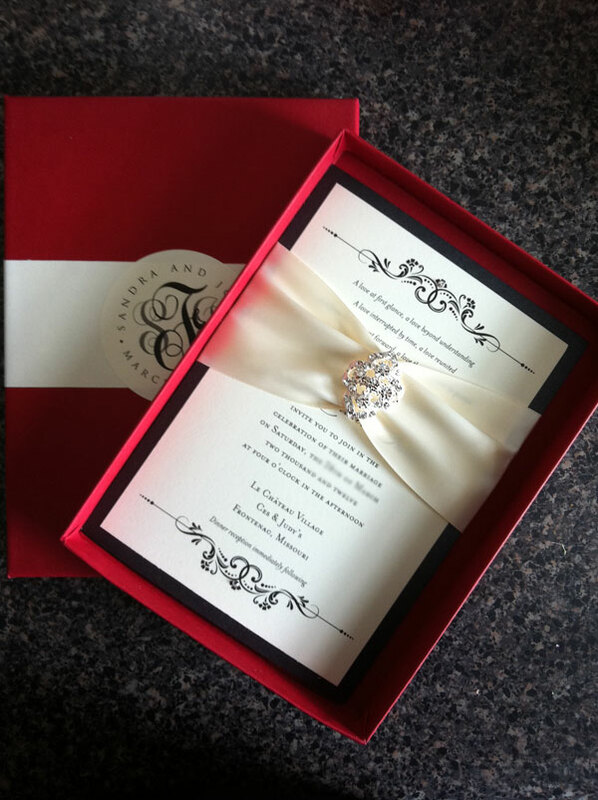 It arrived in a monogrammed red box which when opened contained a number of invitation and RSVP cards all beautifully tied with a satin ribbon and finished off with a sparkling diamond pin. The custom invitation and monogram design were both designed by Slice Of Lime Design. For her ceremony, Sandra chose a lavender “zen” design incorporating a soothing color palette, plus water, fire, and a Budda strategically placed right by the altar. From chair covers to a beautiful custom monogrammed runner (also designed by Slice of Lime Design), no detail was left to chance. 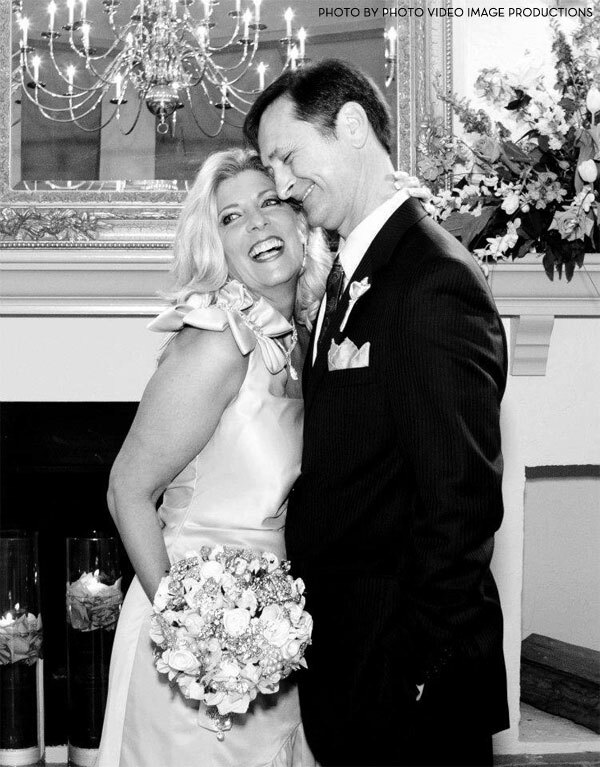 The bride’s dress color was also lavender and the soothing, peaceful, candle-lit atmosphere created an unforgettable intimate ceremony experience… but that didn’t last for long! 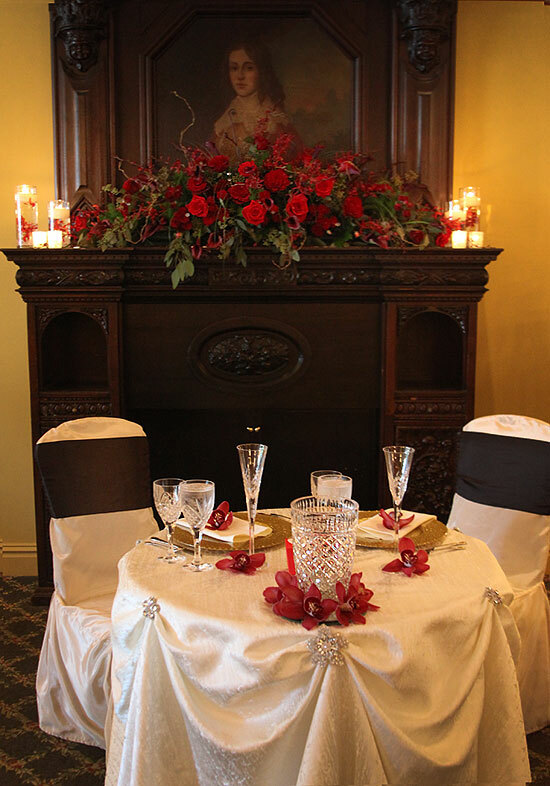 The reception décor was stunning and the BLING factor was definitely off the charts. 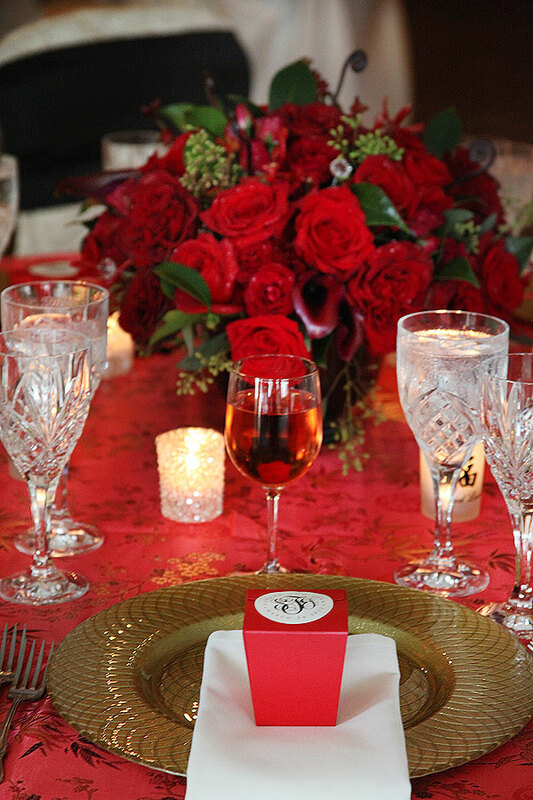 Sandra used the color red as her primary design color, from the red centerpieces, monogrammed favor boxes, and Asian-inspired table linens, to the cake, mantel design, and the bride and groom table. Red roses were everywhere! And of course, there was the BLING! Sandra chose various elements to bring on the shine, glamour, and richness of her design. First, she used rhinestones. 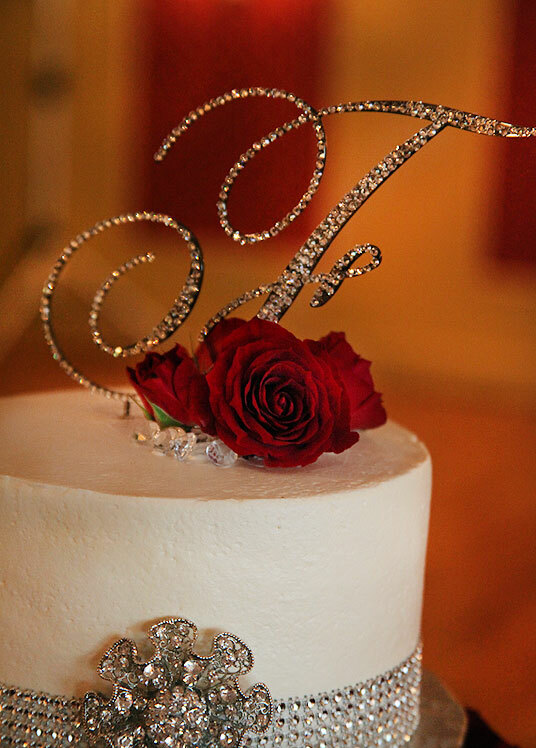 They were simply yet tastefully incorporated into the table numbers while heavily encrusting the beautiful wedding cake. 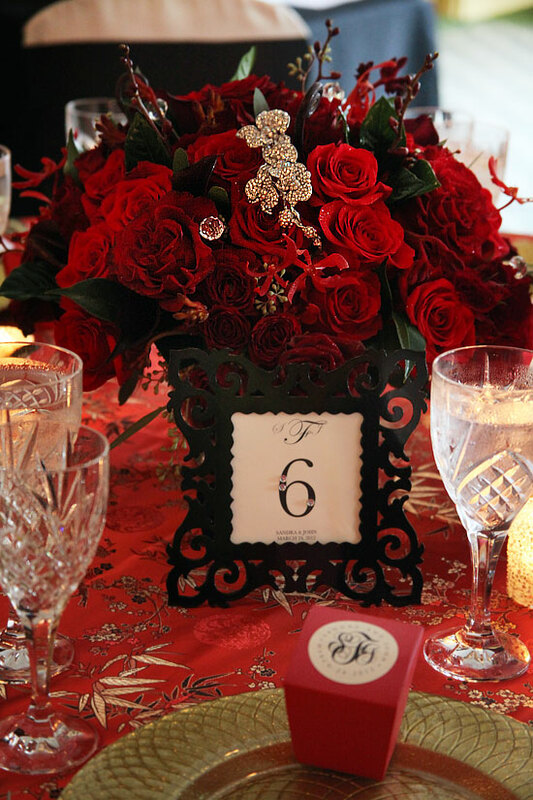 Additionally, Sandra used antique diamond brooches in her centerpieces. Another rich element in her design? Crystal! 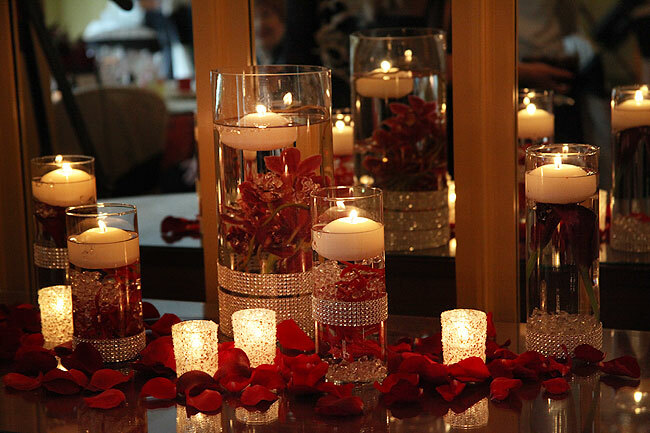 Sandra only used the most beautiful crystal on her tables as well as a crystal vase for her Bride and Groom table. And the cake… OH the cake! 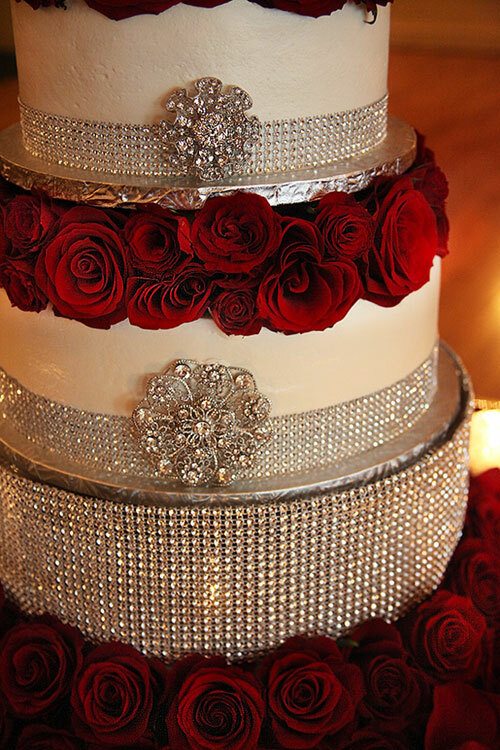 Sandra’s magnificent cake was encrusted in stunning diamonds and diamond brooches. It was truly the focal point in the room… other than the bride and groom, of course! Needless to say, Sandra did an outstanding job of designing her own wedding. I was thrilled and honored to be invited and can honestly say that it was one of the most beautiful weddings I have ever attended!